Who says the bride and her bridesmaids should have all the fun in the wedding photographs? Certainly not me. I love having fun with the groom and his groomsmen, too. I’m asked all the time to take some fun pictures of the bridal party and love coming up with fresh, new ideas. This shot of the groom, his ushers and the adorable little ring bearer was taken at St. Philip Neri RC church in my hometown of Northport, NY. The picture was taken before the ceremony as the wedding guests were gathering outside. In a few short minutes the bride would make her entrance, and head up the aisle with her father, where her groom would see her in her wedding dress for the first time. This photograph was on display in my studio’s gallery for a long time and everyone who saw it asked me to duplicate it on their wedding day. 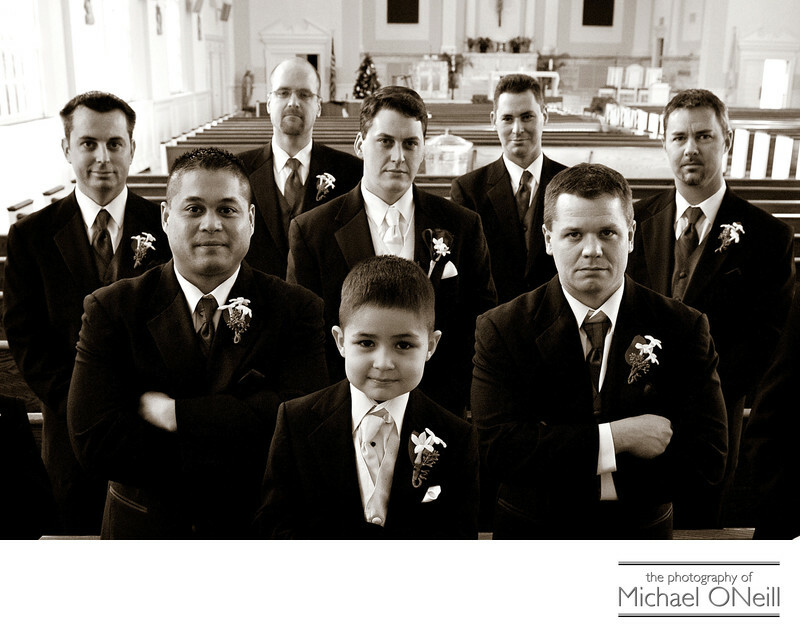 You just have to love that precious little ring bearer hanging out with the rest of the guys. After the ceremony we hopped in the limousines and headed right down Main Street to the Northport, New York Village park on the harbor. This is a great venue for wedding photos as it provides a beautiful waterfront park and a dock that extends out over the water for awesome water views. The couples who really want to have some fun with me wind up walking around the village and taking photos at one of the outdoor bistros, in front of the colonial era buildings or even in one of the many secluded alley ways off Main Street. You will spend more time with me on your wedding day than any other vendor. Make sure your photographer is fun to be with. Take a look at the faces of my clients on this web site and you’ll know that I’m going to be a lot of fun to hang out with on your big day.